Create several convenient bird feeding zones throughout your garden with these Heath Single Suet Cake Feeders. This set of 4 classic, metal suet cages is a fantastic option for offering birds a few different dining spots. Each unit holds a standard suet or seed cake easily, and vinyl coated wire adds hardiness. The green hue of each meshes with the outdoors, and the 1" x 0.875" openings allow birds several places to reach their feed. 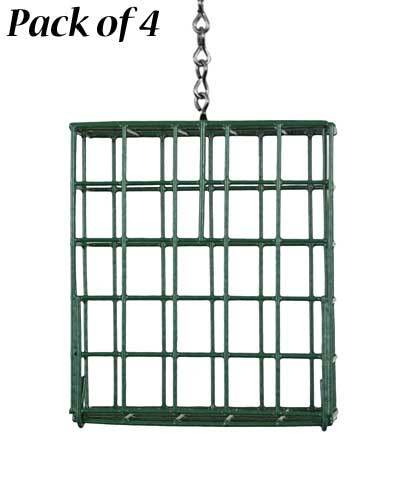 Lift the front panel of each for cleaning or refilling the units, and use the attached chain to hang them within your yard. Place different suet in each cage to see what flavor your backyard birds prefer, and to entice a large variety of them to dine. Keep a few birds well-fed by placing these Single Suet Cake Feeders in your garden. Note: This package contains 4 of the Heath Single Suet Cake Feeders.